For the Nintendo DS version, see Godzilla Unleashed: Double Smash. Godzilla: Unleashed, abbreviated as G3 or GU, is a 3D fighting video game based on the Godzilla film franchise for the Wii, Nintendo DS, and PlayStation 2, developed by Pipeworks Software and published by Atari. The PS2 version was released on November 20 and the Wii version on December 5, 2007 in North America and both versions on February 29, 2008 in Europe. 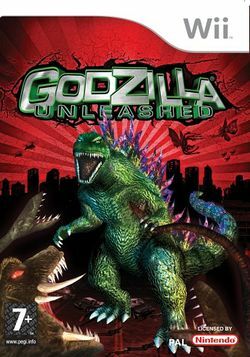 Godzilla: Unleashed was released in late 2009 in Japan. The game is set during a series of unnatural disasters across Planet Earth due to unexplained appearances of large crystals, where the Vortaak alien race are invading once again. The game features over 20 Kaiju and Mechas from all three Godzilla eras; Shōwa, Heisei and Millennium, as well as two newly created Toho approved creations; Krystalak and Obsidius. The story of Unleashed, taking place 20 years after Godzilla: Save the Earth, begins with a meteor shower colliding with the Earth's surface, causing climate shifts and earthquakes. Simultaneously, the giant monsters of Earth begin to attack cities across the globe as a result of massive energized crystals growing from the impact points. Four factions arise from the chaos of the scramble for control of the planet; Earth Defenders, Global Defense Force, Aliens and Mutants. Depending on the player's whims, alliances can be forged and enemies made depending on his or her actions during game. As the battles rage, Admiral Gyozen, captain of the Gotengo sets his own plans into motion to defeat the King of the Monsters, Godzilla himself. After Dr. Shiragami creates Biollante and after attempting to ambush the player on several occasions, a one-on-one battle in Osaka takes place towards the end of the story, before the battle in its first appearance the ship accidentally awakens Megaguirus. This page was last edited on 22 September 2009, at 16:51. This page has been accessed 30,658 times.